(Nanowerk News) They may deal in gold, atomic staples and electron volts rather than cement, support beams and kilowatt-hours, but chemists have drafted new nanoscale blueprints for low-energy structures capable of housing pharmaceuticals and oxygen atoms. Led by UNL's Xiao Cheng Zeng and former visiting professor Yi Gao, new research has revealed four atomic arrangements of a gold nanoparticle cluster. The arrangements exhibit much lower potential energy and greater stability than a standard-setting configuration reported last year by a Nobel Prize-winning team from Stanford University. The modeling of these arrangements could inform the cluster's use as a transporter of pharmaceutical drugs and as a catalyst for removing pollutants from vehicular emissions or other industrial byproducts, Zeng said. This rendering shows the atomic arrangements of a gold nanocluster as reported in a new study led by UNL chemist Xiao Cheng Zeng. The cluster measures about 1.7 nanometers long - roughly the same length that a human fingernail grows in two seconds. Zeng and his colleagues unveiled the arrangements for a molecule featuring 68 gold atoms and 32 pairs of bonded sulfur-hydrogen atoms. Sixteen of the gold atoms form the molecule's core; the remainder bond with the sulfur and hydrogen to form a protective coating that stems from the core. Differences in atomic arrangements can alter molecular energy and stability, with less potential energy making for a more stable molecule. The team calculates that one of the arrangements may represent the most stable possible structure in a molecule with its composition. "Our group has helped lead the front on nano-gold research over the past 10 years," said Zeng, an Ameritas University Professor of chemistry. "We've now found new coating structures of much lower energy, meaning they are closer to the reality than (previous) analyses. So the deciphering of this coating structure is major progress." The researchers reported their findings in the April 24 edition of Science Advances ("Unraveling structures of protection ligands on gold nanoparticle Au68(SH)32"), an online journal from the American Association for the Advancement of Science. 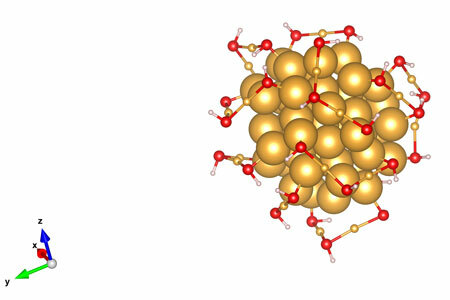 The structure of the molecule's gold core was previously detailed by the Stanford team. Building on this, Zeng and his colleagues used a computational framework dubbed "divide-and-protect" to configure potential arrangements of the remaining gold atoms and sulfur-hydrogen pairs surrounding the core. The researchers already knew that the atomic coating features staple-shaped linkages of various lengths. They also knew the potential atomic composition of each short, medium and long staple -- such as the fact that a short staple consists of two sulfur atoms bonded with one gold. By combining this information with their knowledge of how many atoms reside outside the core, the team reduced the number of potential arrangements from millions to mere hundreds. "We divided 32 into the short, middle and long (permutations)," said Zeng, who helped develop the divide-and-protect approach in 2008. "We lined up all those possible arrangements, and then we computed their energies to find the most stable ones. "Without those rules, it's like finding a needle in the Platte River. With them, it's like finding a needle in the fountain outside the Nebraska Union. It's still hard, but it's much more manageable. You have a much narrower range." The researchers resorted to the computational approach because of the difficulty of capturing the structure via X-ray crystallography or single-particle transmission electron microscopy, two of the most common imaging methods at the atomic scale. Knowing the nanoparticle's most stable configurations, Zeng said, could allow biomedical engineers to identify appropriate binding sites for drugs used to treat cancer and other diseases. The findings could also optimize the use of gold nanoparticles in catalyzing the oxidation process that transforms dangerous carbon monoxide emissions into the less noxious carbon dioxide, he said.